July 16, 2012 -- Syrian government forces battled opposition Free Syrian Army rebels in Damascus in the fiercest fighting yet in the capital during the 17-month uprising against Syrian leader Bashar al-Assad. 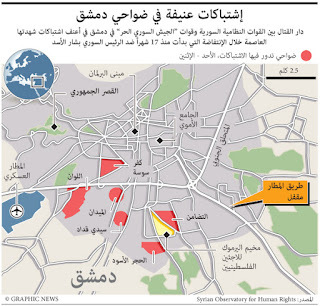 Residents described as the fiercest fighting in the suburbs of Tadamon, , Kafar Sousa, Hajar al-Aswad, al-Lawan , Nahr Aisha , Sidi Qadad and Midan. 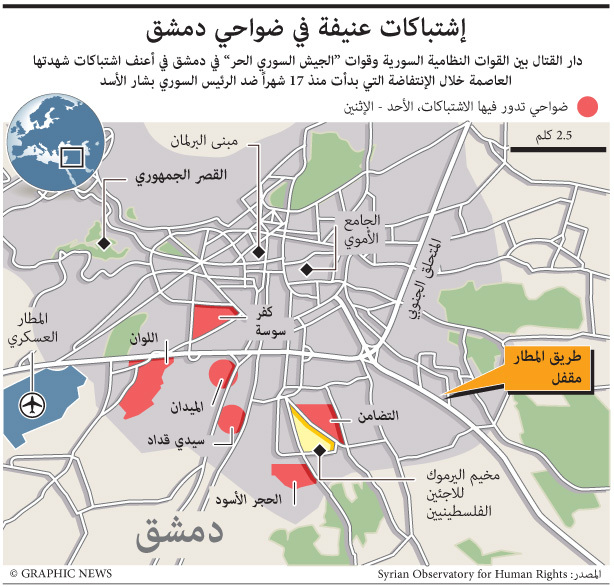 Graphic shows suburbs of Damascus experiencing latest fighting.